Extreame Savings Item! Save 46% on the External DVD Drive for Laptop, Sibaok Portable USB 3.0 DVD-RW Player CD Drive, Optical Burner Writer Rewriter for Mac Computer Notebook Desktop PC Windows 7/8/10, Slim White by Sibaok at Pacs BG. MPN: mimeng507. Hurry! Limited time offer. Offer valid only while supplies last. Overview: Due to the small size of modern Notebooks, an optical drive is often missing from the components and DVD/CD Playback becomes impossible. Due to the small size of modern Notebooks, an optical drive is often missing from the components and DVD/CD Playback becomes impossible. Use our external DVD RW Drive to play DVDs or CDs on Laptop, Notebook, Netbook, Ultra book, PC and MAC. This drive is the perfect addition to any computer that doesn't contain internal disc drive. - USB Optical Drive with the durable plastic casing. Emergency eject hole. - No extra drive, support plug and play, no need to install the driver program, support plug and play. - Record CD, watch DVD movies, burn files, install software and create backup discs. - In the office or on the road, this highly portable, plug-and-play drive requires no software and is conveniently powered through your notebook's USB port. - Supported media types : CD-ROM, CD-R, CD-RW, DVD-ROM, DVD-R, DVD-RW, DVD+RW, DVD+R, DVD+R DL, DVD-R DL, DVD RAM. - Compatibility: WindowsXP/2003/Win8/Vista/7, Linux, Mac 10 OS system, NOT compatible with higher Mac10 OS systerm. - Supported formats: DVD-ROM, DVD-video, CD-R/RW, CD-ROM/XA, CD-ROM, CD-EXTRA, CD-TEXT. 1.This product is a data line interface properly to USB port of the computer. 2.Open the "my computer", in "the mobile storage device should display the drive icon". 3.Click on this icon button, select the "pop" in the tray into the appropriate disk read. ◆SUPPORTS PLUG AND PLAY FUNCTION: No drive and external power needed. Just plug it into your USB port and the DVD drive will be detected. USB 3.0 DVD dirve is a perfect companion for computers without the internal drive. 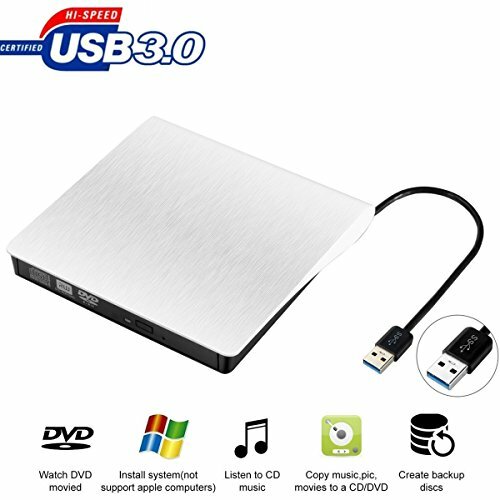 ◆USB3.0 HIGH SPEED INTERFACE: Using advanced USB3.0 technology, this DVD-RW drive provides you high speed data transfer (much faster speed than the USB2.0 port) with strong fault tolerance. compatible with USB 2.0. ◆HIGH COMPATIBLE SYSTEMS: This external drive is well compatible with 98SE / ME / 2003 / XP / Vista / Win7 / Win8 / Win10 / Linux, Mac os10.0 system. ◆HIGH PERFORMANCE: With this external DVD drive, you can watch DVD movies, listen CD music, copy music, pictures, movies to a CD/DVD, install software, or create backup discs, etc. ◆SLEEK AND SLIM DESIGN: Embedded cable design, made with premium wire drawing material, enough fashionable and scratch-proof exterior. This CD/DVD driver is slim, lightweight, compact, portable.